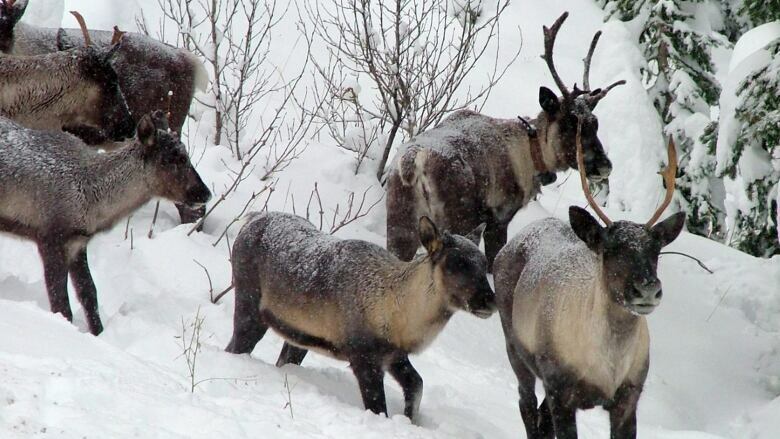 Woodland caribou in the South Peace region of eastern British Columbia could be wiped out despite government efforts to protect them. Researchers from the University of Northern British Columbia and the B.C. government say five subpopulations of caribou could be heading towards extinction, likely because of industrial development. "At current rates of habitat loss and population decline, these caribou, a significant component of Canada's biodiversity, are unlikely to persist," said the paper written by Chris Johnson, Libby Ehlers and Dale Seip. "Although the factors leading to extinction are complex, the cumulative impacts of industrial development are a correlative if not causative factor." Earlier this year, the provincial government ordered a controversial wolf cull in the South Selkirk Mountains and the South Peace to save dwindling caribou herds. The cull is part of a strategy that also includes habitat protection and captive breeding. The study suggests that industrial development is contributing more to the endangerment of woodland caribou than predators. Forestry and agriculture, as well as oil and gas exploration and coal mining, are changing the land, reducing the availability of habitat and providing forage for primary predators like wolves and caribou, said the study. Craig Pettitt with the Valhalla Wilderness Society says it's clear from the research that the province has to stop and reject all development permits in and near core habitat. "Every time we create an opening for some kind of industrial development in the province, we're making deer, moose, elk habitat that draws wolves in," he told Daybreak South. "And what this study is showing is that maybe some scientists say in the short term, we need to cull predators. They found that this is not going to work unless we protect sufficient habitat for mountain caribou." Steve Thomson, Minister of Forests, Lands and Natural Resource Operations, says the province recognizes it has a responsibility to save endangered caribou herd. However, a balance needs to be struck between species protection and industrial activity that brings in revenue for the province. "We believe that the steps we're taking to protect the habitat, the additional steps we're taking to deal with the predator impact through the caribou recovery program, and the offset stipulations that are in place for development will assist in helping recover the herds," he said. Thomson says the government's strategy dictates that any proponent of development in the Peace region must put aside four hectares of land for every hectare impacted. The program aims to ultimately protect over 500,000 hectares of caribou habitat, but it could be five years before it's known whether the wolf cull worked.